Since its the public, through its taxes, that provides the money for astronomy I have always believed that scientists in general, and astronomers in particular, should try to educate the public about science. I try to make a contribution to this by doing the following sorts of things. Giving talks to amateur astronomy societies. If you are an astrosoc secretary and you want a talk then e-mail or write to me. 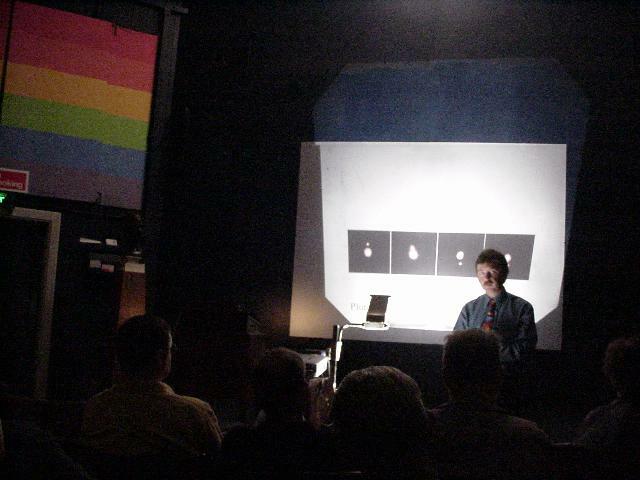 Here I am giving my talk "Is Pluto a Planet?" at the Scottish Astronomers Meeting" in Edinburgh (May 2002). The Pluto story has moved on quite a bit but you can download the original talk (9 Mbyte) , the original script and the updated slides (14 Mbyte) (sorry no script to go with them) if you want to use them for something. You can also obtain my ROE evening lecture (16 Mbyte) on 'The Next Big Thing in Astronomy' but notice that some of the images are movies and they won't run from the download version. My current favourite 'Runaway Rockets and other Space Exploration disasters' is pretty much what is says on the tin. A look back at failures over 50 years of rocketry and space travel. We will see how chance, engineering error and unforeseen circumstances can turn success into failure in the blink of an eye and learn how human ingenuity has sometimes snatched missions, and astronauts, back from the brink of disaster. Featuring runaway rockets, crippled satellites, what really happened to Apollo 13, saving space stations and the 'curse of Mars'. Going into schools and colleges from time to time to talk with students. If you are a teacher and you want this kind of help, let me know. Helping to organise displays and exhibits on astronomy. For example in the ROE Visitor Centre". and helping with the Government's Near Earth Objects Information Centre. Writing books and popular articles in magazines. One of my articles (a piece about planets around other stars) was seen by a project manager at NASA and I was asked if I would like to fly a mission on the Kuiper Airbourne Observatory to write about NASA's FOSTER project which is intended to develop links between scientists and teachers. Here is an article I wrote about my flight which appeared in the British magazine Astronomy Now and which appears with their permission. Teaching at the Top of the World. Astronomy Now. June 1996 pp40-42. Everyone agrees we must encourage young people to study science, the trick is actually doing it. How can we bring the excitement of doing science into the classroom where it can motivate a new generation of astronomers? John Davies flew on the Kuiper Airborne Observatory to experience public outreach, NASA style. For many years astronomers have taken their telescopes to the tops of high mountains in search of excellent image quality, but altitude offers another less obvious advantage. Atmospheric water vapour blocks much of the radiation which arrives from space and the thin, dry air at the summits of high mountains are excellent places from which to operate infrared and submillimetre telescopes. The United Kingdom Infrared Telescope is located on Mauna Kea, a 14,000ft high dormant volcano on the island of Hawaii (see AN Feb 1991 p45), but even at this height the atmosphere is totally opaque to many infrared wavelengths. So, since the 1970's, astronomers have put larger and larger telescopes in aeroplanes, the best known of which is NASA's Kuiper Airborne Observatory, or KAO. The KAO is a highly modified Lockheed Starlifter military cargo jet which carries a 1 metre infrared telescope and a team of astronomers to use it. Although the telescope is not very large by modern standards, the KAO can fly at over 40,000ft which takes it above 99.5% of the atmospheric water vapour and opens windows that can otherwise only be observed from space. The telescope is located in an airtight compartment in the cargo cabin of the Starlifter, just behind the cockpit. Observations are made through a hole in the left hand side of the aircraft which can be sealed by a sliding door when the telescope is not in use. A complicated stabilisation system, which can be linked to the aircraft's autopilot, is used to keep the telescope pointed at its target. The system is both precise and fast acting, enabling observing to continue even if the aircraft encounters moderate to severe turbulence. Although the telescope is exposed directly to the stratosphere, the beam is brought to focus in a scientific instrument which projects through the wall of the telescope compartment into the cabin where the astronomers can reach it if required. THe KAO before starting the mission. Photo John Davies. Since the air at 40,000ft is too thin to support human beings, the rest of the cabin is pressurised so that the astronomers do not need to wear oxygen masks during normal observing. The telescope is controlled by a NASA team of four from consoles in the main cabin, aft of the telescope. Three of them operate the telescope and its supporting mechanical and computer systems and the fourth is the flight director who acts as a link between the astronomers, the telescope team and the pilots. In the same area of the forward cabin are the scientists who sit surrounded by the equipment needed to operate their particular instrument. The number of scientists varies, but is typically about six, and often includes one or more postgraduate students. The KAO makes about 60 flights per year and so many such students have been involved in building and testing new scientific instruments and then flying along and seeing how the equipment actually performs in practice. KAO advocates point out that dozens of PhDs have been won by students trained in this way. The scientist and telescope control stations, plus the computers and other equipment to operate them, occupy about three quarters of the cabin, but the size of the Starlifter makes it possible to carry a couple of extra crewmembers on each flight in the otherwise empty section close to the tail of the aircraft. To take advantage of this opportunity NASA allows teams of science teachers to fly on the KAO and watch the scientists in action. This programme is called FOSTER (Flight Opportunities for Science Teacher EnRichment) and is designed to introduce teachers to scientific research and to build links with scientists who might be able to help the teachers develop ideas they can use in their classrooms. The FOSTER programme began in 1992 (although teachers had flown on the KAO at other times before then) and has gradually expanded every year. The 1995 campaign included 32 teachers from 11 states and began with an intensive ten day residential workshop in California. During the workshop the teachers were introduced to basic astronomical concepts, such as using Right Ascension and Declination to locate objects on star charts, and were shown techniques which could be used to bring these ideas into the classroom. They were also given talks on infrared astronomy, the KAO programme and NASA activities in general. Practical work included planetarium demonstrations and a visit to the Lick observatory. Some of the lecturers were working astronomers, others were teachers who had flown on the KAO in previous years and who had returned to share their ideas and experiences. A chance encounter with the project scientist for the programme led to my being offered a flight on the KAO to report for Astronomy Now and, as an infrared astronomer myself, I did not have to be asked twice. The KAO usually operates from its base at the NASA Ames Research Center in northern California, but unlike most observatories, it can be moved around wherever it is needed and my flight was scheduled to operate from Hickham Airforce Base on the Island of Oahu, just a 45 minute plane ride from my office at the Joint Astronomy Centre in Hilo, Hawaii. The purpose of the flight was to make observations of an interesting structure near the centre of the Milky Way galaxy and two teachers were scheduled to accompany the scientific team. Donna Smith and Jed Lederman were both from California, but came from different schools, one state run, the other a private school and they taught children of different ages. They had teamed up so they could bring a mix of experiences to the programme. The day before the flight we met the organiser of the FOSTER programme, Edna DeVore, and then went to look over the aircraft and talk to the scientists and members of the crew. Everyone was busy, but they all found time to talk to the teachers about the aircraft and its mission. The method of stabilising the telescope by "floating" it over a large spherical airbearing was explained to us and we were shown the complicated infrared polarimeter which was the scientific instrument to be used on the flight. The teachers asked questions, lots of them, and it was obvious they were learning quickly. The day of the flight began with a comprehensive safety briefing and the fitting of the individual oxygen masks we were required to carry just in case a seal failed and the cabin pressure was suddenly lost through the telescope aperture. We also acquired an extra teacher, 55 year old Darla Casey from Oregon, who had so enjoyed herself the night before she pleaded for another ride. Since there was a spare seat this was quickly arranged. The scientists were amazed that anyone would choose to spend another seven hour shift watching them work, but to me this incident highlighted an important impact of the FOSTER programme; here was some-one getting really excited about seeing science in action. Late in the afternoon the principal investigator, Mark Morris, gave the teachers a talk on the science he planned to do. There was just time for a quick dinner before we returned to the airfield for a 7pm briefing. Mission director Carl Gillespie updated the entire crew on the plan for the flight, the weather en-route and the departure time and then we put on our flight suits, grabbed our oxygen masks and went out to the aircraft to prepare for take-off. Inside the KAO is not much like a normal passenger jet. The cabin is basically a long, light green tube with a ramp at the back and pipes and wires running along the roof. There are four tiny windows, designed not for sightseeing, but for checking for fire outside in the event of a crash. Control consoles and panels with computers fill much of the available space except at the back where a couple of seat rows are bolted to the metal floor. There are none of the traditional overhead storage bins, any bags you carry on have to be tied down with bits of rope. At the very back, near the loading ramp, are the compressors which generate the compressed air used by the telescope stabilisation system and which, as a side effect, also generate a lot of heat and noise. Since the KAO is basically still a military cargo jet there is no sound proofing in the cabin and throughout the flight everyone wears earphones to suppress the noise of the engines and wind. If you can imagine the inside of a world war two submarine being depth-charged, you'll have a reasonable idea of what it is like. Soon after take-off, which was something of a mystery since it was dark and it wasn't possible to see out of the windows from our seats, the seatbelt sign went off. At once the scientists started removing batteries and oscilliscopes which, for safety reasons, had been stored in lockers around the cabin for takeoff, and began hooking them up to their instrument so they could begin to check it out. After about 30 minutes we reached 39,000 ft and the telescope team opened the "dome" ready to begin observing. Stars appeared on the TV monitors, but within a few minutes it was clear something was wrong because I could see the stress level rising amongst the science team as they struggled to reduce the noise in the instrument detector system. Not wanting to interfere, Mark Morris paced up and down the fuselage and I could imagine him thinking about how fast his precious observing time was slipping away. Up front the instrument team switched over electronics to try and identify the problem while Edna, the teacher co-ordinator, wisely shuffled us out of the way. Finally things started to work, the data started to come in and the mood lightened noticeably. The astronomer's station on the KAO. The two people looking over the seat backs are schoolteachers. The NASA telescope operator is in the blue flying suit. The actual observing procedure was very like that of a ground based observatory. The science team operated the instrument and took the data while the NASA team pointed and stabilised the telescope using TV cameras. From time to time the scientists would ask to point the telescope at a new object and there would be brief flurry of activity as finding charts were compared with the pictures on the TV monitors. The only big differences were that the observatory shuddered from time to time and we all had to communicate by intercom. Once things calmed down the teachers came up front and each had a go at guiding the telescope while I took notes and pictures. Later Donna and Jed, wearing their blue NASA flight suits, video-taped a lesson while standing next to some of the computer banks at the rear of the aircraft. The whole thing was just like "Star Trek" and I'm sure their students will love to watch it. The back of the aircraft was the teachers domain. They had hung springs, scales, balloons and gyroscopes from the ceiling and video-taped them every time the aircraft turned or bounced in turbulence, or the air pressure changed. The idea was to demonstrate typical examples of physics such as inertia, pressure variations and angular momentum in this unusual environment. From time to time we compared notes on our experiences using a private intercom channel and I took a moment to ask if FOSTER was delivering the goods, were the teachers being "enriched"? The answer was a resounding yes! In particular Jed spoke of his four highlights from the flight so far. The technical highlight had been in the cockpit during take-off when he had been exposed to another new science, aerodynamics, as the pilots had explained what they did to fly the aircraft. The scientific highlight had been talking with Mark Morris after his observing had finished. A few hours earlier they had spoken about what he hoped to find, and in the air they had reviewed what they had actually seen, comparing prediction with experiment in the traditional scientific fashion. His professional highlight had been making the inflight video so he could share his experience with his students and a personal highlight had been guiding the telescope during the observing. He told me this gave him a real feeling of involvement in the project and at this moment he had stopped being an outsider and become a participant. Later I mentioned this to one of the science team who told me jokingly that Jed had been staring at the guide star screen so intently they thought he would burn it out! About seven hours into the flight it was time to pack-up. The astronomers wanted another 90 seconds of observing time to finish a particular observation, but the flight plan wouldn't permit it. The mission director said "No, cage (lock) the telescope and close the dome" and down we went. Once again I was struck by the similarity to ground based observing, many astronomers have raced the clock trying to get in just one more observation before being forced to stop by the rapidly brightening dawn sky. This was a technical reason to stop observing, not a natural one, but the effect was just the same. Aboard the aircraft the same scenes were now played out in reverse, the batteries and oscilliscopes were removed from the telescope and stored, the carry-on bags were tied down and seatbelts were fastened. By prior arrangement with the flight crew, I headed up to the cockpit to watch the landing and strapped in behind the pilot as we began our descent in the pre-dawn darkness. It was very quiet in the cockpit as the flaps were lowered and the wheels went down and we landed with barely a tremor. We were soon back at our parking slot at Hickham with engines stopped and the doors open. Within a few minutes almost everyone had vanished to their beds for some well deserved rest, but the teachers and I were the last to leave, savouring what had been a remarkable experience. We were lucky to fly on the KAO when we did. The observatory has been in service for 20 years and is due for retirement. NASA want a bigger, better, aircraft called SOFIA, the Stratospheric Observatory For Infrared Astronomy. Expected to begin operations in about the year 2000 SOFIA will be a 2.5 metre telescope carried aboard a converted Boeing 747SP Jumbo Jet. SOFIA is built in collaboration with Germany and the use of a commercial jet means that it will be much easier to operate away from its base, since many major airports are equipped to support Boeing aircraft. However, SOFIA comes at a price, some of the money to pay for it will be saved by stopping KAO operations. By the time you read this the KAO may have made its last flight. It will leave a legacy of tremendous scientific achievement and, for the teachers of the FOSTER programme, something else. One of them told me that NASA, by going to all this trouble and expense, had sent a very clear message that scientists really care about science education and, when personal contacts can be made, the scientists are willing help as much as they can. That is a lesson for all of us.